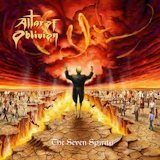 The Seven Spirits raises the melodic doom sound of Altar of Oblivion a notch or two, a welcome change in a band previously high in technical skill but reluctant to embrace sheer earthshaking power. There still isn't a lot of grit in their sound, and there are places where the band softens the music instead of applying crushing pressure, but the band's riffing and Mik Mentor's operatic baritone result in memorable moments here. While the first track is a bit repetitive, and a few tunes still have more quiet introspection than a listener may like, the descending bassline of No One Left almost immediately displays the band's power/doom sound at its best -- I'm reminded almost of a doom version of Euphoreon, especially on Language of the Dead. The melodies are simple, but the amount of volume and bass-driven heaviness -- the bass gets a lot of room to shine on this production, which gives the guitars an exceptionally firm foundation -- gives Mentor's funereal delivery its air of grand sorrow even at the band's fastest. Which, incidentally, is where they have their greatest success. That's underscored by the fact that whenever they let up on the heaviness and try to do anything quieter or slower, the wind in their sails slackens. Their keyboard/clean guitar combinations aren't bad, they're just nothing to write home about. But The Seven Spirits embraces their epic tendencies more than ever before, meaning that for every quiet moment, the persevering listener is rewarded with crushing riffs fronted by a twin-guitar melody wailing over the wreckage. As in the previous couple of albums, the songs are kept fairly short and tightly structured; nothing is allowed to try the listener's patience. Listeners who wished for a heavier atmosphere from Altar of Oblivion are likely to be pleased this go-around. While retaining a taste for the soft and the clean at times, The Seven Spirits delivers a version of their sound that has the volume knob turned markedly higher.